Montana linebacker Dante Olson runs with the ball during a soggy spring practice in Washington-Grizzly Stadium on Wednesday. MISSOULA — Montana senior Dante Olson knows where he’s going to put the plaque he got from the NCAA for being the per-game leader in tackles at the FCS level last season. The linebacker just hasn’t gotten around to putting it up on the wall at his home yet, even though he got the plaque back on March 18. Proud but humble, the hungry Olson has been far from satisfied with his performance and has continued to work on taking his game to another level this spring. He’s learned to not let the last play, good or bad, stick with him from one snap to the next. But just ask the 6-foot-3, 237-pound Olson about what he didn’t like about his play last season, and he has a long list. Olson’s performance was good enough to help him land on seven All-America teams and finish third in voting for the Buck Buchanan Award, given to the top defensive player in the FCS. His stat line included 151 tackles, which broke Kendrick Van Ackeren's school record of 130, 11 tackles for loss, six sacks, three forced fumbles and two interceptions. It was quite the showing for Olson in his first year as a starting linebacker. Even so, Montana head coach Bobby Hauck has seen how the grounded Olson hasn’t let the success he had that year get to his head. Those guys include Townsend’s Jace Lewis, who’s been taking first-team reps alongside Olson this spring, Kalispell Glacier’s Patrick O’Connell, Helena Capital’s Marcus Welnel and sophomore Michael Matthews, among others. 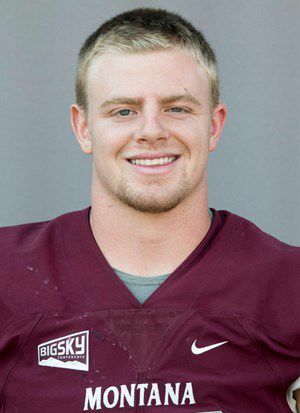 As Olson is now going through Hauck’s defensive installation for the third time, his increased familiarity with and understanding of the scheme allows the Griz to spend time focusing on creating depth behind him. For Olson, having a better season in 2019 means the defense as a whole playing better. That in turn should mean helping the team as a whole improve upon its 6-5 record. It’s a message the team-first Olson knows and one that was reinforced by former Grizzlies Brock Coyle, Jordan Tripp and Tyrone Holmes when they reached out to him after seeing the breakout season he put together. As the soft-spoken Olson tries to embrace that role as a defensive leader, he said the key is getting guys fired up. It’s also keeping them that way for 60 minutes since Montana blew four fourth-quarter leads in eventual losses last season. In 11-on-11 action during Wednesday’s practice, quarterback Dalton Sneed connected with wide receiver Sammy Akem in stride on a post route for a 64-yard touchdown pass. Sophomore transfer running back Marcus Knights broke off a 64-yard touchdown run by bouncing out to the right. Backup quarterback Cam Humphrey fumbled two snaps. The rainy conditions may have played a factor. The first fumble was recovered by junior Brennan Corbin, who came into camp as a tight end but has been practicing with the defensive line since spring break. Corbin ran back the ball about 34 yards for a touchdown. Junior Gavin Crow, a cornerback who’s been working with the safeties, tipped a Garrett Graves pass intended for senior tight end Colin Bingham. True freshman linebacker Braxton Hill, from Anaconda, caught the tipped pass and ran it back about 40 yards for a touchdown. MISSOULA — Montana kicker Brandon Purdy never lost a high school football game at Legends Stadium in Kalispell.